The West Coast isn't a dreamy place for many workers. Millions of Americans are languishing there in part-time jobs with no other options. In California alone, 1.2 million people are "underemployed." That equals the entire population of San Francisco and Oakland. California is the hardest state for part-time workers to find full-time jobs, according to CNNMoney's analysis of previously unpublished data from the Labor Department. The Golden State is hardly alone. Nevada, Oregon, and Arizona are nearly as bad. Washington is also above the national average. Part-time workers are far more likely to live in poverty. They are paid less than other workers and often don't receive benefits. It's a bad sign when states have a high percentage of part-time employees in the labor force, especially those working part-time involuntarily because they can't get a full-time job. "It's a sign that the labor market isn't healthy enough," says Robert Valletta, an economist at the Federal Reserve Bank of San Francisco. The worst state: In California, the nation's largest state economy, 7.1% of the workforce consists of involuntary part-time workers. That's well above the national average of 4.7% in October. To look at it another way, California has over half a million more underemployed workers now than in 2007. That's greater than the population of Sacramento. Part-time work always increases in a recession, but the alarming sign is that it hasn't gone down much during America's recovery. Eight states, including New York and New Jersey, still have double the number of involuntary part-time jobs since the recession began, according to the Labor Department. 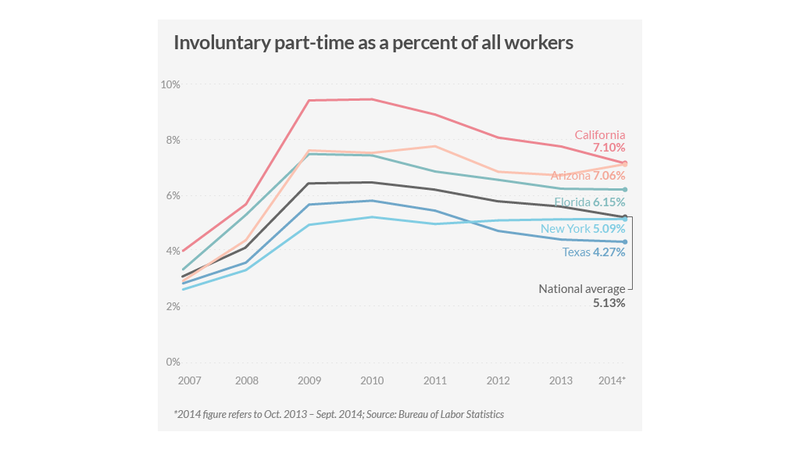 And involuntary part-time jobs are actually increasing in places like Florida and Texas. Alarming trend: The growing concern is that the part-time job trend is here to stay. Look at Pennsylvania: its unemployment rate is right below the national average, but its number of involuntary part-time workers is about 90% higher than when the recession began. The West has a particularly acute problem. Agriculture and forestry are big industries in West Coast states that have lots of seasonal employment, which may help explain their part-time problem, says Chris Tilly a professor at UCLA. "Both [industries] tend to have high rates of unemployment in the off-season, but also higher rates of involuntary part-time," Tilly says. Nationwide, Tilly added: "Employers have been moving in that direction towards maintaining more part-time work whether people want it or not." Even good state economies are struggling with part-time. Texas has added lots of jobs in the economic recovery and its unemployment rate is below the national average. But there are 72%, or about a quarter million, more unwanted part-time jobs in the Lone Star State than when the recession began. Economists are not exactly sure why some states have such high rates of involuntary part-time compared to others. Eight out of the 10 states with the highest part-time rates have unemployment rates above the national average, according to Labor Department data. But that's not true everywhere. "It's an enigma," says Valletta. "For some of the states there's a disconnect between the status of their labor market as a whole...and a surprisingly high level of involuntary part-time work."